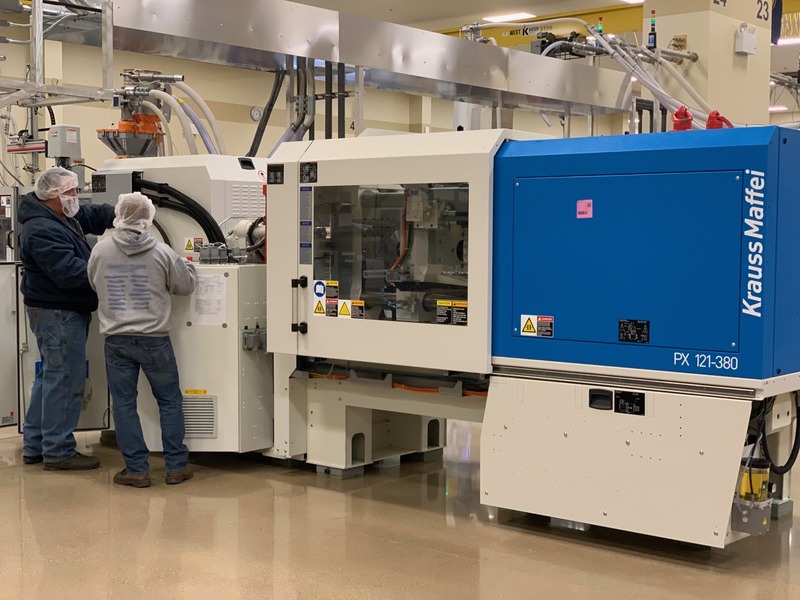 Lincoln, NE – HTI Plastics recently received a new Krauss Maffei Injection molding machine for beta testing. The PX All-Electric arrived on our floor in late January. Lincoln, NE – HTI Plastics recently received a new Krauss Maffei Injection molding machine for beta testing. The PX All-Electric arrived on our floor in late January. This is the second time HTI has been selected to host a Krauss machine for testing, with the option to purchase. This machine has a cleanroom-compatible surface in high-gloss, antistatic design. It has grease-free, chrome-plated tie rods. The PX All-Electric allows for faster demolding with ultra clean sprue pickers, which saves costs over the entire service life. It has enclosed, electric ejector with absolute precision and reproducibility. The parts are handled within the protective housing. This machine is a great fit for cleanroom production requirements.